If you’ve followed this blog for a while then you know I’m a big fan of Milk Bar, a bakery in New York famous for cookies, pies and flavored milk. Due to the fact it’s thousands of miles away and I can’t make it there very often, I was happy to hear about this new book — Momofuku Milk Bar by Christina Tosi. Finally! I can stop trying to recreate the recipes myself! And judging by the success of the first recipe, the Cornflake Chocolate Chip Marshmallow Cookies, there are a lot of good Mill Bar (ish) cookies in my future. But it’s fun to look at the past, right? The fact is I started trying to clone Milk Bar’s cookies before I’d even tasted them. The first attempt was this Butterscotch Cornflake Marshmallow Cookie which ended up being nothing like Milk Bar’s but still pretty good. Not as good, but tasty. I tried the Compost Cookie recipe posted on the Regis & Kelly site and ended up with pretty good replica. Of all the cookies, it’s still probably my favorite. And then there were the Blueberry and Cream Cookies which were an experiment in using some liquid glucose I found in the cake decorating section of Michael’s. I was told that the bakery uses glucose rather than corn syrup and I kind of wonder if the book is going to send people to cake decorating aisles or on-line stores to buy glucose or if it will just suggest corn syrup. At any rate, I can stop gathering information from miscellaneous sources and get the facts straight from C. Tosi. This book is a real gift. Speaking of which, I’m debating whether to buy it right now or to put it on my Christmas list. If I do the latter, I have one recipe from the book to hold me over. 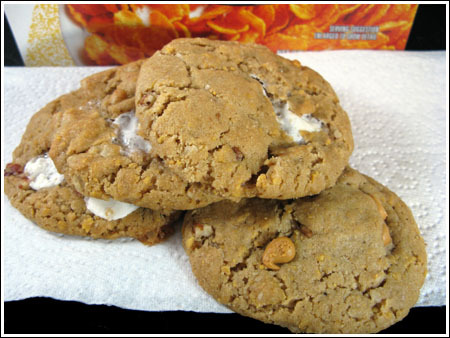 Thanks to Daily Candy for sharing the recipe for Momofuko Milk Bar’s Cornflake Chocolate Chip Marshmallow Cookies. They were fun to make and as buttery, rich and flavorful as the ones I bought in New York. The trick is to make a crunchy mixture of corn flakes, dried milk powder, butter and sugar, which you stir into the final batter. I also noticed that the cookies stayed fresher longer than regular chocolate chips cookies. On Day 1 they were great, but Day 2 they were pretty darn good rather than dried out and hopeless, which is the case with a lot of Day 2 chocolate chip cookies. Plus the dough freezes exceptionally well. In fact, the best cookies came from dough that I’d frozen and thawed. I’m sure the book is full of tips, but since I don’t have it yet I’ll just share some tips I gathered from making the cookies. Click here to get the recipe or look for the book! — For the flour, I used 4.5 oz/126 grams for every cup, though I think I could have easily gotten away with a slightly heavier cup. — The dough must be chilled. No joke. Don’t try to skip that step. The cookies that I made with dough that had been chilled for a few hours were fine, but slightly flatter than the ones made with dough that had been chilled for a few days. The best cookies were made with the dough that I’d frozen for a week then thawed. — The bake-time in the recipe is 18 minutes at 375F. In my oven, this produced slightly burnt edges – maybe a little too burnt. I got the best results when I put the cookies in a 375F oven and immediately reduced the heat to 350F. But ovens vary, so you might want to bake your first ball of dough using the book’s directions just to be safe. That’s awesome! I’ve never heard of Milk Bar, I’m excited to find some and try it! I love cereal in cookies! I usually make these with coco puffs (http://badtadmd.com/?p=325 which have peanut butter and a really unique texture that is really fun), but I do love Life, so I’ll definitely have to try these! My cookies are usually pretty flat too, but if I push the edges inward they firm as they cool and end up looking like actual cookies rather than puddles of goo. With all that fat and sugar, I think there’s very little margin for error, so there’s some ingredient that’s causing problems. It also might be your cookie sheet. Are you using a thin cookie sheet? You might have better luck if you used a heavy duty cookie sheet or stacked one sheet on top of the other. If you know it’s not the cookie sheet, the other things you could try are reducing the sugar somewhat and/or using bread flour. I think she mentions in the book that she uses bread flour at the bakery, and in my own personal experience I’ve had cookies bake up with a better structure when using bread flour, especially King Arthur. The type/brand of butter might play into it as well. I’ve noticed cookies spread less when I use European style, so you might want to give that a shot too. So there are four things to try on your next batch — use a thick cookie sheet, pack the brown sugar very lightly, use bread flour and use European style butter. Even though those things sound like really minor changes, you might get better results doing all or even just a couple of those things. About the milk, I’ve been using non-fat dry milk powder. I think they’re pretty much all the same, but I’m not an expert on dried milk. Hello! I realize this is a realistically old post but I was hoping you could give me some tips. I have made these cookies three times from the cookbook and they will not hold up. They all become this flat cookie mass. I have chilled the dough overnight, changed the temp,tried not to over beat the dough but I can’t figure it out. Please help! Also, when making the cornflake mixture the milk powder is not dried milk correct? I just ate this cookie from the bake shop. It almost had a sugary glaze on the outside which I can’t quite explain. 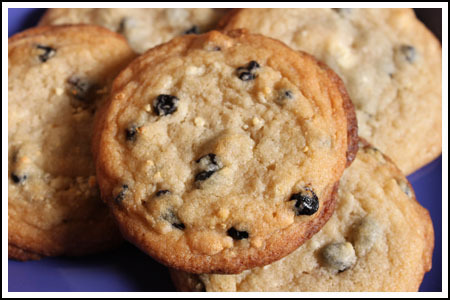 The Compost Cookie had it too, but the Corn Cookie and Blueberries & Cream Cookie did not. We’re getting more today so I’ll let you know. They definitely have a lot of butter! You just never know with oven temps and times. 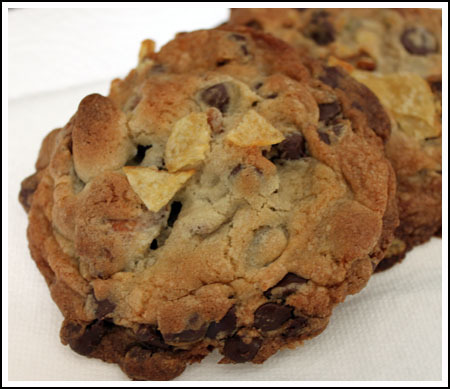 I just baked the new crispy chocolate chip cookie recipe from Food TV. It said the bake time was 350F for 20 minutes for standard tablespoon size cookies. They were done in 13. So either there was a typo or their ovens were different. Who knows. But yes, her cookies are buttery and mine spread quite a bit. Honestly, I sort of can’t believe I’m saying this, but I just think most of Tosi’s recipes have too much butter in them. And I love a buttery cookie! But if I make these again, I’m going to cut back on the butter by maybe half a stick. Also, I don’t know, my oven does run a couple degrees hot, but it’s pretty close to accurate, and my cookies would’ve been little piles of ash by 18 minutes at 375. Like you, I reduced my oven to 350, and they still didn’t take anything like 18 minutes. Some of my marshmallows completely disintegrated (still sort of good taste-wise but it did lead to some structure-compromising holes 🙂 but I do only use homemade marshmallows so that could play a part, I don’t know. I got the cookbook at our library and also was reading it like a novel! 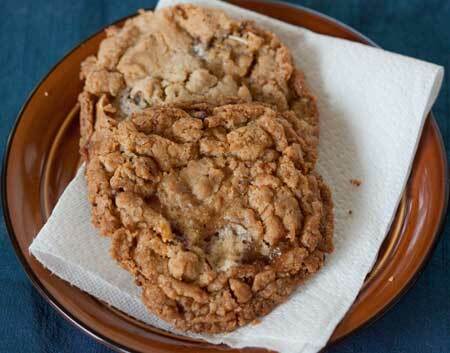 Though all of the recipes seemed over the top sweet to me, the photo of the cornflake cookie was irresistable. I followed the directions to the letter ( whipping the butter and sugar as directed, refrigerating the dough as directed). The results were amazing cookies that seemed to get better as the days went by. I had no problem with spreading. I did find that I needed to cut back on baking time by about 2 minutes. The only change I will make (when we definately make these again) is I think I will make them smaller. There really can be too much of a good thing! Heidi, I need to send a batch to my husband’s office. Thanks for the reminder. Mine wouldn’t have looked good if I hadn’t pushed them inward towards the middle with a spatula. That really did the trick. I made the cornflake marshmallow chocolate chip cookies a couple of weeks ago. I packaged them up and sold them at work. I could not believe how quick they sold! Everyone raved about them! I thought they were good but they sure were not attractive cookies! I have never been to the bakery so I’m not sure how the original tastes. I will definitely make them again! Michelle, that’s great! I’m so glad to here there are weights. Maybe the structure issues are due to the protein content of the flour? How much air is beaten in during that 8 minutes? I don’t know. I’m just going to keep following the directions as written and pushing inwards with a spatula if they spread too much. That seemed to work. The book is actually very precise, the weights are given in grams and regular measurements , for example 240 grams flour equals 1.5 cups, which is a fairly typical flour measurement in her recipes. I just think that seems way too low on flour to support the structure of the cookie. I have never had an actual baked good from Milk Bar, maybe they are supposed to be flat and spread out so that is why they have so little flour? Anyway, the book is beautiful and well worth buying! Hi Michelle, I’d be curious to know how much her cups of flour weigh. I agree that it might be smart to use something like 5 oz per cup as opposed to the usual (at least what I use) 4.5 oz per cup. Also, the cookies are always better when you really chill the heck out of the dough. Glad to hear the book is really detailed and fun to read. I went ahead and bought the book already…haven’t made anything yet but the list of ingredients and products she uses is great…lots of details and brand names, plus stuff that I have never bought before but am looking forward to trying out. One thing I have noticed about her cookie recipes: they call for lower than usual amounts of flour. I think the ideas/flavors are intriguing but I am going to be adding extra flour to all these recipes, to ward off the possibility of thin, flat cookies. Thanks for the detailed post! Wow, I wish our library would get new books that quickly! I would love to try one of these! But, your version also looks great with those marshmallows peeking through. I love marshmallows. You’d think I was 5 for my love of marshmallow things like Rice Krispie treats. I’ve always wanted to go to Milk Bar to try all their goodies! Glad they are coming out with a book! My sister once made me a version of the cornflake cookies that were great. Slightly different recipe. Seen here if you’re interested. I’d really love to try the blueberry next. I got luck and WON a copy of the book! Sounds like I need to buy cornflakes and give these a try. My husband loves cereal and keeps a whole cabinet full plus a dozen replacements in the pantry, but cornflakes is not one of them. 🙁 I have everything else. You said these were good the next day. I think it’s the powdered milk that does that. I have powdered milk specifically for a couple of recipes and I’m not sure what the magical quality is, but I think it helps preservation. I admit, it’s the first time I’ve heard of these cookies. The name of those cookies alone is a mouthful! Once you get your book, I’d love to hear your thoughts on it. Louise, thanks for pointing me towards the Daily Candy comment page. I didn’t even think to look at the comments, but it appears people are having the same issues they had with the Compost cookie. I wonder if these people are whipping for the full 8 minutes with the paddle? I also wonder if maybe they’re trying to bake the dough cold. The spreading is a concern, but that problem was easily remedied by tapping inward toward the center with the spatula. I always do that when cookies spread. Another problem is people could be using really thin baking sheets. That sometimes causes spreading. I’d be curious to see how an experienced baker such as yourself fares with the recipe. The cookies from Daily Candy were super buttery, held their shape, and VERY close to what I had at Milk Bar. In fact, when I bought the cookies for the first time I wondered how in the heck the managed to fit so much butter into one cookie. The answer must be the crunch. Maybe the book has some more trouble-shooting tips that the Daily Candy article didn’t have. Coincidentally I was thinking about Compost Cookies a couple of days ago, wondering if they were just a passing fad. I didn’t realize that her book was being published. Some commentors on the Daily Candy site seemed to have problems with this cookie, claiming there was too much butter to flour etc. Doesn’t sound like you had any real issues. Thanks for commenting. I was worried nobody was interested ;). Also, I had that same problem with the crunch mixture. I think it’s what she uses in her popular crack pie. I think Christina Tosi is going to be on Conan tonight, btw.